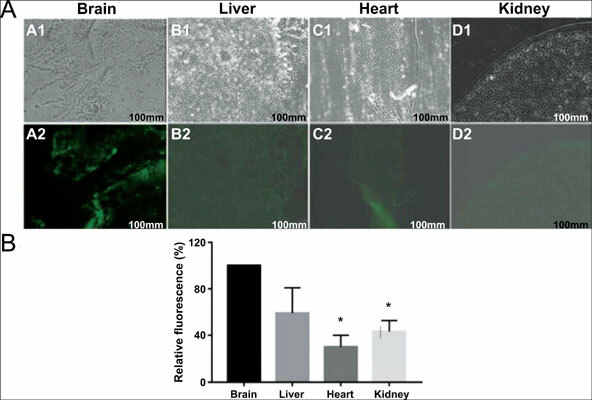 Objective: To verify whether the botulinum toxin heavy chain HCS has specific neuronal targeting function and to confirm whether TAT-EGFP-LC has hydrolyzable SNAP-25 and has transmembrane biological activity. Methods: We constructed the pET-28a-TAT-EGFP-HCS/LC plasmid. After the plasmid is expressed and purified, we co-cultured it with nerve cells or tumors. In addition, we used Western-Blot to identify whether protein LC and TAT-EGFP-LC can digest the protein SNAP-25. Results: Fluorescence imaging showed that PC12, BV2, C6 and HeLa cells all showed green fluorescence, and TAT-EGFP-HCS had the strongest fluorescence. Moreover, TAT-EGFP-LC can hydrolyze intracellular SNAP-25 in PC12 cells, C6 cells, BV2 cells and HeLa, whereas LC alone cannot. In addition, the in vivo protein TAT-EGFP-HCS can penetrate the blood-brain barrier and enter mouse brain tissue. Conclusion: TAT-EGFP-HSC expressed in vitro has neural guidance function and can carry large proteins across the cell membrane without influencing the biological activity. Botulinum toxin, heavy chain HSC, CNS, in vitro, in vivo, drugs.